Royal Academy of Engineering President, Professor Dame Ann Dowling, delivered the inaugural Sir Richard Olver Engineering Lecture. 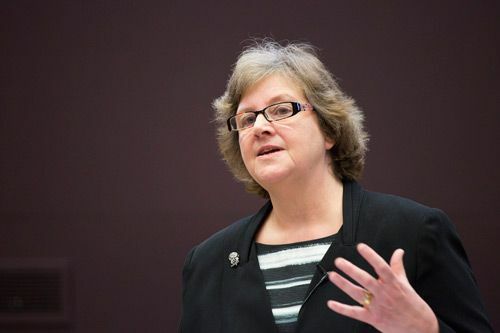 On 29th March 2017, Professor Dame Ann Dowling OM DBE FREng FRS, President of the Royal Academy of Engineering, addressed a City, University of London audience on the importance of research and innovation as engines for growth across the UK. 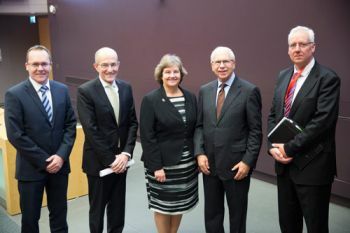 Titled, “Research and innovation – engines for growth”, Dame Ann delivered the first Sir Richard Olver lecture at City, which was supported by BAE Systems. Sir Richard was Chairman of BAE Systems for 10 years up until 2014. Exploring the government's proposals for industrial strategy, Dame Ann drew on the findings of a review that she had chaired in 2015 into business-university research collaborations and outlined ways in which large and small businesses and academic ecosystems can form closer, more productive relationships. Analysis of impact case studies from the Research Excellence Framework had highlighted the importance of university research in delivering demonstrable economic returns. However, the Review also discovered inefficiencies – for example, in many cases, a single university could have several different interactions with one company, but the connection could be made by different parts of the university – meaning that opportunities to develop long-term strategic partnerships with industry could be missed. These included reducing complexities; building strong relationships; connecting potential partners where there may be mutual benefit; growing critical mass; agreeing suitable terms of engagement and ensuring that research and innovation are fully integrated into industrial and sectoral strategies and that universities are considered as core partners in the development and delivery of industrial and sectorial strategies. Dame Ann identified three broad criteria for the success of the industrial strategy: it needs to be a whole-government undertaking, designed and implemented as a system; it must be long-term and sustained beyond the current parliamentary cycle; and it must exploit the opportunities offered by leaving the EU while mitigating risks. Dame Ann also described the work of the Academy’s Enterprise Hub, which provides grants and critical expert mentoring by Academy Fellows to budding entrepreneurs. 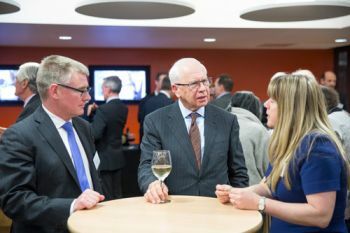 In addition, she noted the importance of encouraging more people to acquire STEM skills, and described some of the work of the Academy to encourage more young people from a range of backgrounds to take up an engineering career. BAE Systems has demonstrated its commitment to engineering education at City, through the BAE Systems Sir Richard Olver Chair in Aeronautical Engineering and the Research Chair in Nature-Inspired Sensing and Flow Control for Sustainable Transport, supported by the Royal Academy of Engineering and held by Professor Christoph Bruecker. Critical mass is the minimum size or amount of resources required to start or maintain a venture.